The Iconfactory relaunched Twitterrific for macOS today. 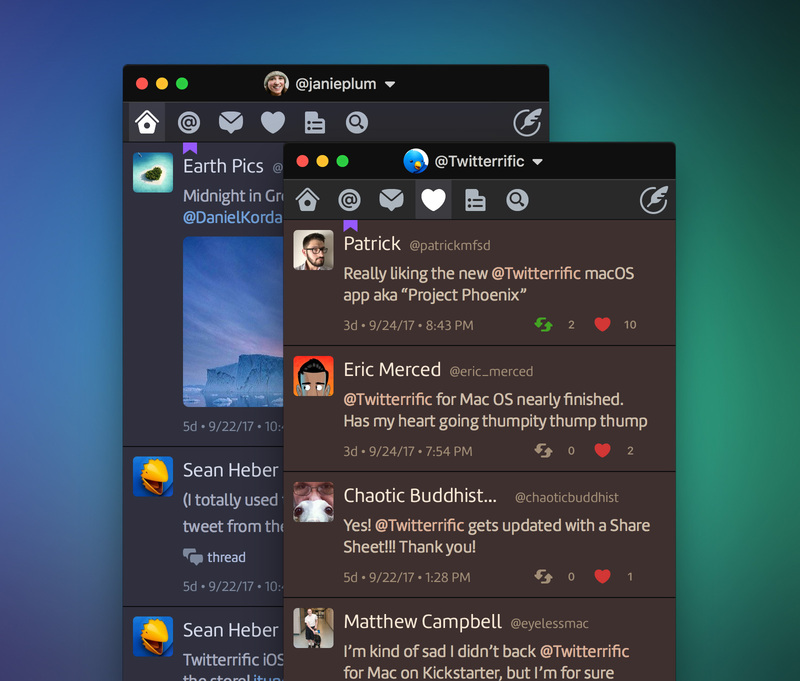 The relaunch began as a Kickstarter campaign codenamed Project Phoenix and has resulted in a great 1.0 release that brings Twitterrific back up to date with other macOS Twitter clients. Like most other Twitter clients, Twitterrific brings the whole host of Twitter interactions — tweet, reply, send direct messages, favorites, and lists, to name a few. More importantly, Twitterrific’s hallmark feature — like on iOS — is its customization options. Users can change fonts and font sizes, switch between dark and light themes, and change how images and videos are displayed. With the relaunch of Twitterrific, The Iconfactory has also added support for multiple windows and timelines, accessibility improvements through VoiceOver, and a redesign supporting the latest Retina Displays, Notification Center, and full screen mode. This includes adoption of the system-wide share sheet to copy links and text and open a tweet in a browser, send a tweet to Notes, or send a tweet to other social media services. Saved tweet drafts are not available in Twitterrific for macOS. Managing your profile and lists is not currently available. Muffles, or Twitterrific’s “mute filters,” cannot be managed on the macOS version of the app. Regardless of the differences between the iOS and macOS apps, Twitterrific’s relaunch has brought the app back into the year 2017. In its current state, Twitterrific is a worthy competitor to Tweetbot for macOS. 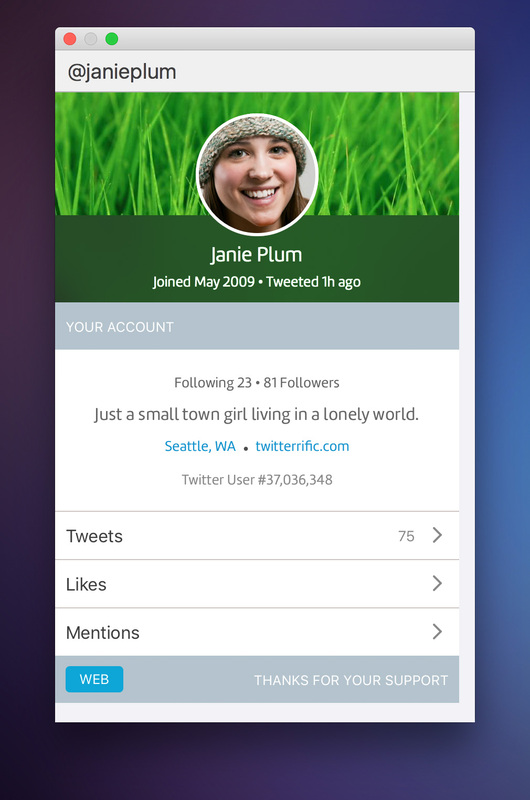 Twitterrific’s design customization and the app’s overall character help it stand out from the rest of the pack. As it stands, Tweetbot remains our favorite Twitter client for the Mac. Although the level of customization may not be at Twitterrific’s level, many of the notable features missing from Twitterrific’s 1.0 release can be found in Tweetbot for macOS. 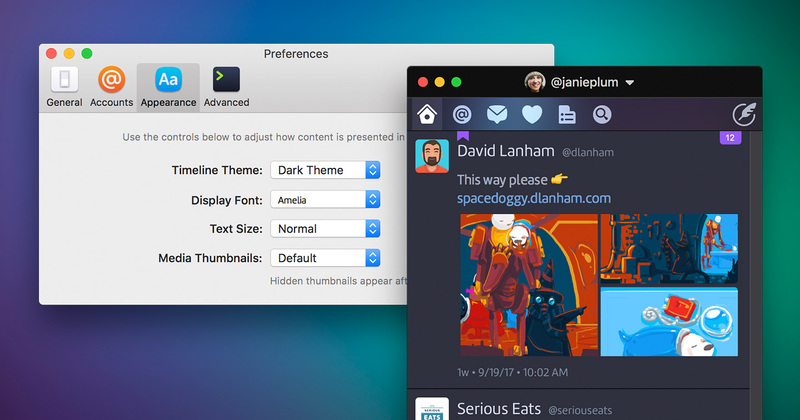 You can find Twitterrific on the Mac App Store today for $19.99.